May 31, 2008 on a rainy night in New York and a wet track at the Icahn Stadium on Randall Island as the athletes entered the blocks for the 100m with a favourable wind of +1.7m/s. A false start from Michael Rodgers but the second time round everything was clean. Jamaica's Usain Bolt made headlines around the world with a stunning new world record of 9.72secs as he underlined his credentials as a serious gold medal contender at the upcoming Beijing Olympics. American world champion Tyson Gay only saw the back of Bolt who shaved .02secs off the previous mark held by compatriot Asafa Powell. His obvious nickname is "Lightening Bolt", a fitting monikor considering his time of 9.76secs on May 3 in Kingston, the second fastest time ever and in only his third 100m race. His coach Glen Mills tried in vain to convince his protege to take up the 400m due to his fragile physique but Bolt was having none of it saying one lap of the track was too tough and his instincts were right as his surge to stardom has proved. Mills obviously sat up and took notice of Bolt's electric speed when he ran 10.03 in the summer of 2007 at the Greek island of Crete. 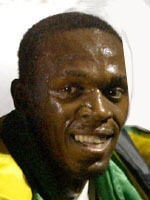 But his scepticism was party due to Bolt's weakened state at the 2004 Athens Games and his failure to finish the 200m at the 2005 world championships in Helsinki. Injuries have restricted the arrival of Bolt on the international scene of stars but signs of his unquestioned talent was on view in 2002 when he became the youngest 200m junior world champion at 15 years and 332 days when he crossed the line in 19.93secs. With his size, Bolt is not the quickest out of the blocks but he makes up for it with an explosive finish. "Who says he's a bad starter?" retorted Powell's coach Stephen Francis. "He led the race start to finish". Bolt was originally scheduled to run just the 200m at Beijing after a silver medal at the 2007 world championships behind Gay at Osaka. While some have questioned Powell's big race temperment, Gay seems his likliest rival after clocking a wind assisted 9.68secs five weeks ahead of the Games but the American failed to qualify for the 200m after breaking down with cramps during the US Olympic trials. As the world record holder, Bolt is on the verge of a rare 100m-200m double that has not been witnessed at the Games since 1984 when Carl Lewis pulled it off in Los Angeles. As well as talent, Bolt also has deep ambtions. "This world record means nothing as long as I don't have the Olympic gold medal or world title," he blasted. Regardless of his results in the Chinese capital, Bolt has time on his side as he will be just 22 years-old during the Games.